This year’s Churchill Fellows weekend is running on April 9 and 10 and features Professor Klaus Larres, author of “Churchill’s Cold War” and many other essays and articles about Churchill and recent European politics, as the 2016 Kemper Lecturer. The weekend will also feature the exhibit “The Prime Minister, the President, and the General,” commemorating the seventieth anniversary of the Iron Curtain Speech and the role of Major General Harry H. Vaughan in inviting Churchill to Westminster College, and a Q and A about Churchill, the Cold War, and the legacy of the Iron Curtain Speech, amongst much else. Please see our website here to find out more or to register for a place at the 2016 Churchill Fellows. Professor Larres is Richard M Krasno Distinguished Professor of History & International Affairs, Department of History, University of North Carolina, Chapel Hill.l Find out more about Klaus Larres here. The Crosby Kemper Lectureship was established in 1979 by a grant from the Enid and R. Crosby Kemper Foundation of Kansas City, Missouri and provides for lectures by authorities on British History or on Sir Winston Churchill. For additional information contact Meda Young at meda.young@westminster-mo.edu or (573) 592-5602. Previous Kemper Lecturers: Most of the lectures through 2000 are available in booklet form in the museum shop. Churchillians will not want to miss the world premiere of an original one-man show about Churchill the artist and a one-day symposium featuring six top experts on Churchill! The National Churchill Museum invites you to the closing weekend of The Paintings of Sir Winston Churchill exhibition on February 12-14, 2016. On Friday, February 12, we will feature the world premiere of the one-man show “Painting As a Pastime: Banishing the Black Dog,” written and performed by Randy Otto as Sir Winston Churchill. Drinks, hors d’oeuvres, and the show from 5:30 to 7:30 pm in the Kemper Art Museum atrium. Purchase tickets here. More about Randy Otto here. On the following day, Saturday, February 13, learn more about Winston Churchill from six celebrated authors of recent books about Churchill during a symposium on “The Multifaceted Life and Legacy of Sir Winston Churchill.” Authors include Larry Arnn (Churchill’s Trial), Warren Dockter (Winston Churchill and the Islamic World); James W. Muller (editor of Churchill’s The River War); Michael Neiberg (Potsdam); Simon Read (Winston Churchill Reporting); and Jonathan Sandys (God and Churchill). Register for the symposium and purchase the author’s books here. Symposium begins at 9:30 am in the Steinberg Auditorium across the plaza from the Kemper Art Museum on the campus of Washington University. Conclusion at 4:30 pm. For general information about the exhibition, which will give directions and parking information for the show and symposium, visit kemperartmuseum.wustl.edu/Churchill. If you would like to purchase tickets for the show or register for the symposium in a manner other than online, please call Meda Young at the National Churchill Museum, (573) 592-5602. The performance by Randy Otto is underwritten by a grant from the Allen P. and Josephine B. Green Foundation as part of the paintings exhibition educational program. The symposium is a program of the Sandra L. and Monroe E. Trout Professorship of Churchill Studies at the National Churchill Museum, Westminster College, Fulton, Missouri. We are pleased to announce that ‘Winston Churchill: A Passion For Painting’ is released today. Written by artist Edwina Sandys, Winston Churchill’s Granddaughter, and featuring a foreword by Boris Johnson, Mayor of London and Churchill biographer ‘A Passion for Painting’ explores Churchill’s most beloved pastime and shows us another side to the twentieth century’s most renowned statesman. You can find out more about ‘Winston Churchill: A Passion For Painting’ here. To order a copy of the book please see this link or or contact us. The book is also available to purchase in the National Churchill Museum store from Monday 11 January. There is another picture to be painted of Winston Churchill: the portrait of him as an artist. 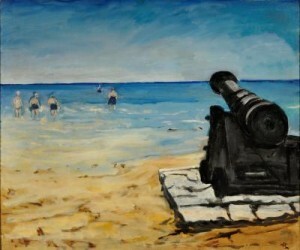 A Passion for Painting explores Churchill’s most beloved pastime. The National Churchill Museum is pleased to announce the release of ‘Winston Churchill: A Passion For Painting’. This brand-new book, a must have for Churchill fans, is written by Edwina Sandys, Winston Churchill’s Granddaughter, with a foreword by Boris Johnson, Mayor of London and Churchill biographer. Would you like to know more about the man behind the myth and what inspired him in his more reflective moments? Then this is the book for you. To order a copy, please print off and return the Order Form or contact us. 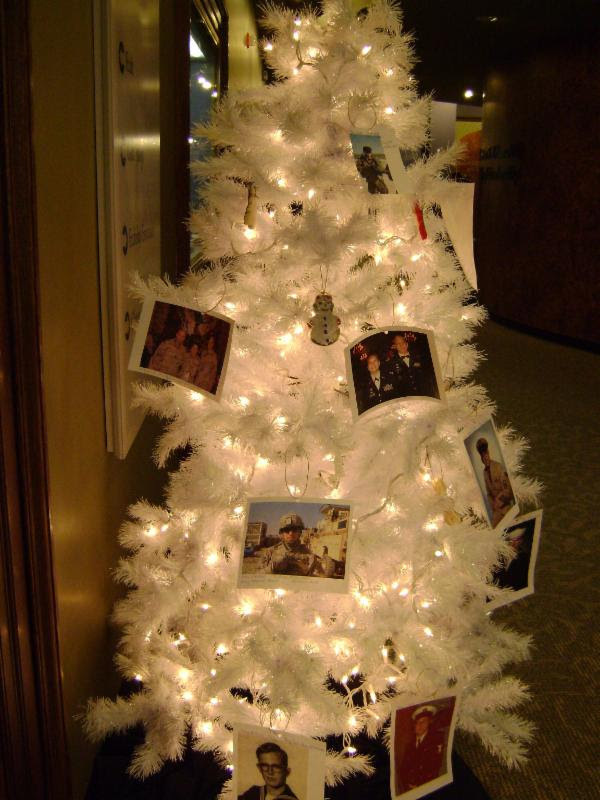 Every November around Veterans Day the National Churchill Museum asks you to help us remember the service given by members of our armed forces by sending in photographs of Veterans to display on our Honor Tree. 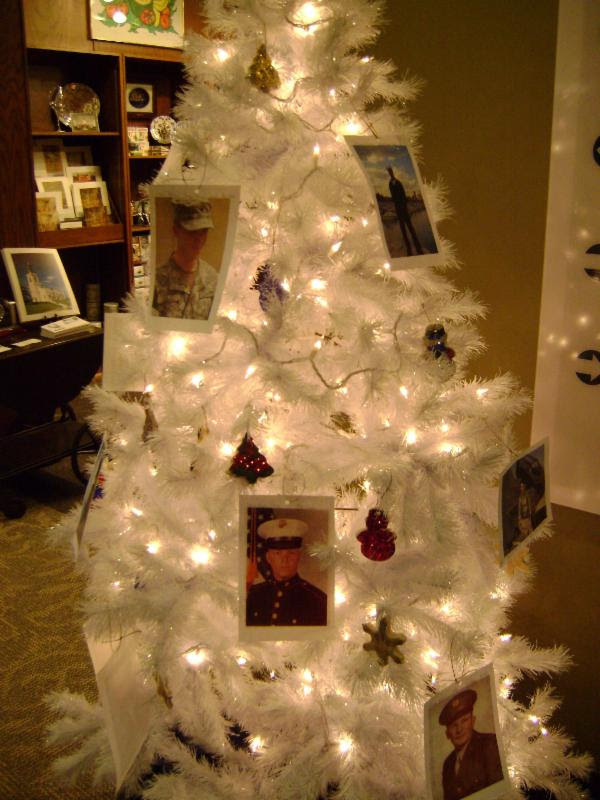 Placed at the entrance to the National Churchill Museum, the Honor Tree is a moving tribute to the men and women whose service and sacrifice we remember on November 11..
To help us construct this tribute we ask that you send in a photograph of a Veteran – a friend, family member or loved one who has served our country. 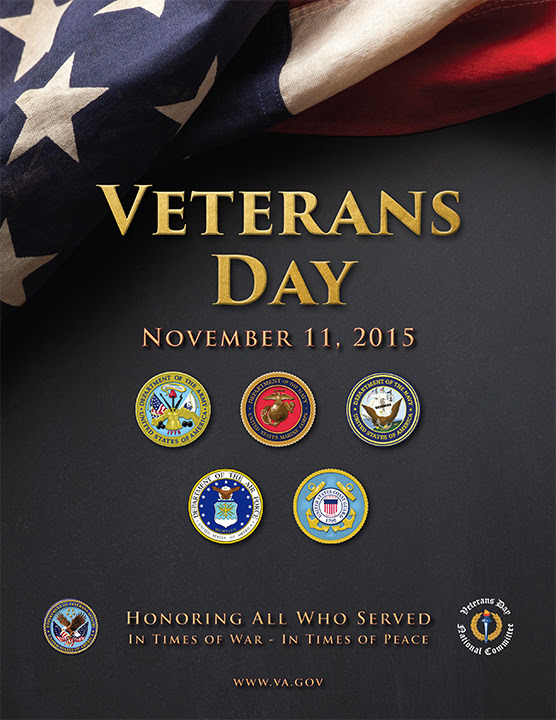 Please include whatever information you wish – the Veterans name, rank, branch or years of service or a little about them. 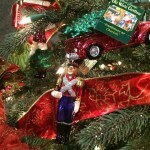 For more than thirty years the National Churchill Museum has celebrated the holiday season with a Victorian Christmas. This year’s celebration of festivities, inspired by an authentic French Marketplace, will open on Thursday, November 12, 2015 and will feature a huge range of beautiful holiday gifts, from ornaments to unique presents for friends and family. The celebration will run throughout the holiday season, but make sure to join us for the opening event on November 12, where we’ll welcome visitors of all ages to the Museum for a feast of Christmas shopping accompanied by a traditional English kettledrum tea, snacks and spirits. What’s more, you can visit the beautiful Church of St Mary Aldermanbury which will be decked out in Christmas garlands – there’s no better way to welcome in the festive season. All proceeds from the Victorian Christmas go to support the National Churchill Museum. To find out more about the launch of our Victorian Christmas celebrations please contact us, visit the Museum’s website or call on 573-592-5369. This November the National Churchill Museum is pleased to both honor the contribution our Veterans have made to our country and to celebrate the life of Sir Winston Churchill, by opening for free on both Veterans Day (Wednesday November 11) and Churchill’s Birthday (Monday November 30). Join us at America’s National Churchill Museum, located on the campus of Westminster College in Fulton, Missouri, where you can discover why Winston Churchill’s legacy continues to inspire new generations today, fifty years after his death. The Museum is open from 10:00 AM – 4:30 PM and you can find directions and further information about the Museum on our website here. This Fall is an exciting time for the National Churchill Museum as we launch two exhibitions which showcase the diverse artistic talents of the Churchill family. Starting in October we’re pleased to announce an exhibition of the artwork of three members of the Churchill family; Churchill Family Artists. Winston Churchill (1874–1965) is one of the most renowned statesmen of the twentieth century and was well-known for his love of painting, but he was not the only member of the Churchill family drawn to the arts. The Churchill Family Artists exhibit will be an opportunity for the National Churchill Museum to showcase some of the rarely-seen works of art held in our archive by three members of the Churchill family; Edwina Sandys, John Churchill and Sarah Churchill. Each of these artists have their own distinct perspective, and the pieces exhibited will help visitors to the museum learn about the artistic streak that ran through the Churchill family. Following this in November, the National Churchill Museum, in collaboration with the Mildred Lane Kemper Art Museum, part of the Sam Fox School of Design & Visual Arts at Washington University in St. Louis, is excited to annouce a the launch of The Paintings of Sir Winston Churchill. This exhibition offers a unique opportunity to view paintings rarely seen in North America . Bringing together forty loans from preeminent public and private collections in the United Kingdom, Canada, and the United States—including the Royal Academy of Arts in London and Chartwell, the historic Churchill family estate in Kent, England—this exhibition surveys the full range of Churchill’s art, from landscapes and seascapes to still lifes and portraits. These exhibitions will be of interest to visitors of all ages with an interest in the arts or those curious to know more about the private and family life of this most mercurial of British statesmen. You can find out more about both exhibitions here. A Westminster graduate who has headed the Albert Gore Research Center for the past six years now returns to the College to guide the future of the National Churchill Museum December 15. Dr. James H. Williams, Class of ’86, was selected after an extensive national search to be the new Executive Director. Dr. Williams has served as Director for the Albert Gore Research Center and a Professor of History at Middle Tennessee State University from August 2008 until December 2014. In this position, he led the archive, museum, and educational organization at Tennessee’s largest undergraduate university. As a part of his duties, he supervised 14-16 people, was principal fundraiser and development officer, program and grant writer, and was responsible for all aspects of budget management. The Gore Center contains a varied collection of archival materials, museum artifacts, audio visual materials and an active educational and outreach program. Overlapping with his work as Director of the Gore Research Center and Professor of History, Williams served as Coordinator for the American Democracy Project from 2007-2009. Dr. Williams has worked in the History Department at Middle Tennessee State University since 1996, first as an Assistant Professor (1996-1998), then as Associate Professor (1998-2005) and finally as a full Professor (2005-Present). He is currently working on three book manuscripts, has given over 30 academic paper presentations at national meetings and published a dozen articles in distinguished journals. 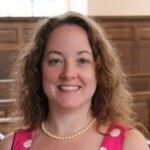 Dr. Williams holds a Ph.D. in Early American History from Vanderbilt University, an M.A. 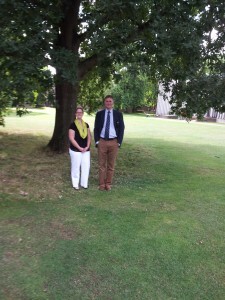 in Colonial American History from The College of William and Mary and a B.A. in History from Westminster. In 2000 he was elected a Churchill Fellow at Westminster. Dr. Williams worked as a tour guide at the Museum, which was then called the Winston Churchill Memorial and Library, from September 1984 to May 1986, when he was a student at Westminster. Mail Call – what wonderful words. The only thing better would be to hear your name called out. These two words have special meaning for those who have served in the military and we are very pleased to have the Smithsonian’s traveling exhibit Mail Call here at the National Churchill Museum through October 19th. And these two words have special meaning for me personally. 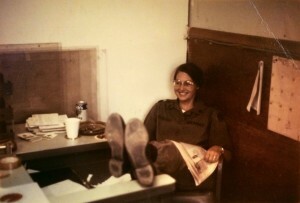 I served in the Women’s Army Corps before it was assimilated into the U.S. Army mainstream. It was a strange time for female soldiers as we lived separately but worked together with the men. And it was great time to be a WAC and wear the Pallas Athena on my collar. First story – my mother’s mother, a Texas lady, had three grandchildren serving during Vietnam – my two cousins who served in the Navy and me. Each month, our names were shouted out at Mail Call in our various duty stations. Grandma Oakes mailed the exact same package to each of us each month – never a change: two pair white athletic socks, one pack Camel non-filter cigarettes, and divinity candy. This popular package arrived like clockwork, rain or shine, stateside or overseas. Trades always ensued for the candy, smokes and socks; I never did develop the taste for divinity. My cousins and I lived for those packages as this was that touch of home that kept us going in tough times. Second story – although billeted in an all-female barrack affectionately known as the WAC Shack, we all still received our mail at our company’s mail room and joined in sharing packages, news from home and jokes while hanging around the day room. One day, my life changed with a single letter. I had written a letter to the comic, David Brenner, who I saw on late night TV and sent it in care of NBC Hollywood. He wrote back a hysterically funny letter. No one was there when I received my letter – except a lone NCO who took an interest in the story, got us some coffee, and proceeded to ask about the letter. We shared stories and photos from home, drank that awful day room coffee and, eventually, he asked me to a dance. 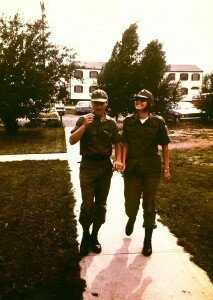 We were married ten months later. As I walk through Mail Call – a wonderful exhibition of photos, letters and stories about getting mail to the military all over the world, I catch a glimpse of my story here and remember those packages and letters that followed me around the globe. WHEN DOES ONE MARK THE START OF WWI? When does one mark the start of WWI – particularly with this year as the 100th anniversary of its start in 1914? Commentary by Kit Freudenberg, Interim Executive Director. On June 28, 1914,the Austro-Hungarian Empire’s heir, Archduke Franz Ferdinand and his wife Sophie, were assassinated in Sarajevo. International condemnation and concerns were voiced by the major European powers that Austria-Hungary would retaliate against Serbia whom they believed to be responsible for the assassination. 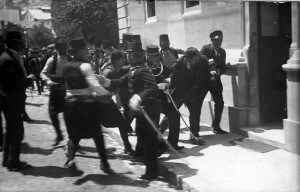 On July 23, Austria-Hungary sent a list of concessions to Serbia including one which specifically demanded that Austria-Hungary be involved in the judicial process for the Serbians connected to the killings. When this demand was rejected, the Austro-Hungarian Empire declared war on Serbia on July 28 and a total breakdown of diplomatic measures followed. This is a simplistic view of the diplomatic alliances; however, from July 28 to August 4, envoys talked peace or neutrality while their military prepared for war. Russia, champion of Serbia and its Slavic population, mobilized its troops to take action. Germany demanded this action cease, presented an ultimatum to Russian and prepared its own mobilization plans. In four short days, the alliances led Germany to declare war on France and Great Britain that led Great Britain and France to declare war on Germany. Russia, not to be left behind, declared war on Germany and Austria-Hungary. Shortly after dawn on Sunday, August 2, 1914, German troops cross the border into the Grand Duchy of Luxemburg and declared the military action was necessary to protect the railways against a French invasion into its Rhineland. On Monday, August 3, the German ambassador informed the French government that a state of war between the two countries began. At 9:45 pm on Tuesday, August 4, Germany declared war on Great Britain and that evening, Great Britain declared war on Germany. The tally for World War One: over 9 million men killed, 30 million injured – and countless civilians uprooted and acres of landscape mutilated. Although named The War to End All Wars, it did not rather set the stage for a second world conflict. For an excellent look at the build-up and inter-alliances, I highly recommend Max Hastings’s book Catastrophe 1914: Europe Goes to War. The 2014 Summer Churchillian magazine soon to be printed reviews steps taken by Winston Churchill in these perilous times as his nation prepared for war. Please enjoy this Churchill Chat with Interim Executive Director Kit Freudenberg and Artist George Tutt, the curator of the Annual Missouri International Watercolor Show here at the National Churchill Museum for the past 14 years. Hear the story about how he became an artist/illustrator in the U.S. Army, his experience with the watercolor show, and his announced retirement. Also, make sure to watch our previous Chats with Director of the Churchill Archive Centre Allen Packwood, and Churchill’s great-granddaughter Jennie Churchill! Lady Soames, daughter of Winston and Clementine Churchill, Churchill Fellow, and NCM Board Governor, died Saturday, May 31st, at age 91. Born Mary Spencer-Churchill on Sept. 15, 1922, she was the youngest child of Clementine and Winston Churchill and enjoyed family and famous visitors who visited her parents. At the start of WWII, she joined the Red Cross and later the Army’s Auxiliary Territorial Service, manning anti-aircraft batteries in England, Belgium, and at near the end of the war in Germany. She accompanied her father on several of his wartime trips and met President Harry Truman and Soviet leader Joseph Stalin at a post-wartime conference in Potsdam, Germany. After the war, she married Christopher Soames who served as a Member of Parliament and a diplomat. They had five children. In 2005, she was appointed a Lady of the Garter by Queen Elizabeth. In addition to her own memoirs, A Daughter’s Tale, she wrote a biography of her mother and Winston and Clementine: The Personal Letters of the Churchills. Here in Missouri, Lady Soames celebrated the major events with us starting in 1969 with the dedication of the Winston Churchill Memorial and Library at Westminster College. As you look at the event photos, you will see that she stood during the dedication by the Right Rev. Anthony Tremlett, Bishop of Dover, UK. She became a Churchill Fellow and served on the Museum’s Board of Governors. In 2006, she returned to Fulton for the rededication of the Museum and its new exhibitions. We all will remember as Lady Soames exuberantly lofted the grand scissors skyward after cutting the ribbon. And I had the pleasure of chatting with her in 2011 in London during the NCM Churchill’s England Tour. A very gracious lady in person and in title. The National Churchill Museum is excited to present another episode in the Churchill Chat series. Enjoy this conversation between Westminster College President Barney Forsythe and Allen Packwood, Director of the Churchill Archive Centre and a Fellow of Churchill College. Don’t miss our previous Chats with people like Churchill biographer Paul Reid and Churchill’s great-granddaughter Jennie Churchill! Teachers can enjoy all the exhibits at the National Churchill Museum for free anytime during the month of June as Museum officials celebrate Teacher Appreciation Month. “Educators play a significant role in the success of the National Churchill Museum, so we wanted to express our appreciation to them for the great job they do,” says Mandy Plybon, Education & Public Programs Coordinator for the National Churchill Museum. This special offer applies to educators of elementary through university students. Educators from either public or private institutions and from homeschooling families are welcome to enjoy this opportunity. Educators must bring documentation in the form of an identification card showing they are a currently employed educator or paperwork showing they are student teachers in order to receive the discount. If a member of a homeschool group, the educator should bring a paper card, mailer, email, or some other documentation showing membership. The National Churchill Museum is open daily from 10 a.m. to 4:30 p.m. Regular admission prices are Adults-$7.50, Seniors-$6.50, College Students and Youth-$5.50, Children (6-11)-$4.50, and Children (5 and under)-free. For more information about the National Churchill Museum, visit www.nationalchurchillmuseum.org. Allen Packwood, Director of the Churchill Archives Centre and a Fellow of Churchill College, will open a special D-Day exhibit, “D-Day Normandy: Operation Overlord,” at a reception from 4:30 p.m.-6:30 p.m., Friday, May 30, at the National Churchill Museum. Open until July 20, the exhibit tells the story of the greatest amphibious operation ever launched–the Normandy Invasion—through the visions and images of three of the U.S. Navy’s most talented combat artists: Mitchell Jamieson, Alexander Russo and Dwight Shepler. 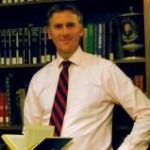 The speaker of the opening day event, Allen Packwood, is the first full-time director of the Churchill Archives Centre at Churchill College in Cambridge, England. He is an expert on Churchill, responsible for the personal papers of Lady Margaret Thatcher and other great figures of recent British history. In his presentations, Packwood brings to life the 3,000 boxes of Churchill letters and documents from his first childhood letters to his great war time speeches. Widely hailed as the turning point of World War II, the Normandy Invasion, or Operation Overlord as it was known, sent 1,000 ships, the greatest armada ever to set sail, from the British Isles to the Normandy coast on the night of June 5, 1944, to launch the liberation of Europe. Over 200,000 Allied soldiers landed on the French beaches there and although the cost in human life was high, the invasion held and the door to Europe was opened. More than two months later, Paris was liberated and within the year Hitler was dead and German defeated. While the invasion forces gathered throughout Great Britain, the U.S. Navy assigned combat artists to record the great adventure. During their training period, the artists lived with the crews of the vessels destined to take part in the Invasion. They rode the ships across the English Channel and accompanied the troops as they landed. Jamieson crossed the channel on D-Day on the deck of an LST and went ashore with the first demolition units at Normandy. Russo accompanied naval forces on a landing craft on D-Day. Shepler was on an American destroyer during the invasion and recorded the holocaust that was the first American beachhead in France. 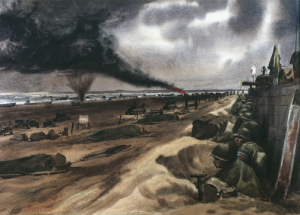 This special exhibit divides the paintings into five different sections: Pre-Invasion Days, D-Day: The Troops Move In; D-Day: On the Beach; D+1 through D+3 and D+4 and Aftermath. 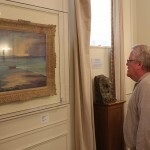 The exhibit is on loan from the U.S. Navy Art Collection. 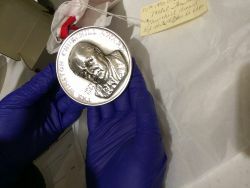 This week’s blog comes from one of the National Churchill Museum’s most dedicated volunteers, Whit. Keep reading for his thoughts on volunteering at the Museum, specifically on his experience giving tours. “Throughout the year, particularly in the spring, large groups of middle school and high school students request tours of the National Churchill Museum. It can become quite busy if more than one group is scheduled on the same day. The Education and Public Programs Coordinator, Mandy Plybon, has established a well-thought-out educational program for training volunteers. 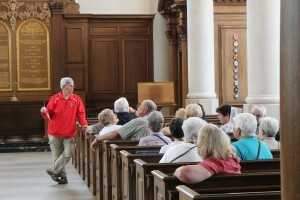 Tours can be taken from several different points-of-view. For example, younger students may find a scavenger hunt in the Museum challenging and rewarding, while older high school students may be more interested in topics on leadership or World War I, World War II, or the Cold War. Thanks to Whit for sharing his National Churchill Museum story. If you’re interested in volunteering at the National Churchill Museum, you can find more information on our website’s volunteer page, or you can contact Mandy Plybon directly. Volunteers contribute many hours of service, sharing their knowledge, skills and talents throughout the Museum and our events. We thank our volunteers with discounts in the Museum shop, invitations to special exhibits and events, free family membership after hitting important volunteer benchmarks, an invitation to our annual Volunteer Appreciation Dinner, and more! If you’d like to be a part of the pool of Museum volunteers, especially those willing to work with our school groups, children ages 6-18, contact Mandy today! Please enjoy the fourth installment in our Churchill Chats video series featuring Sir Winston Churchill’s great-granddaughter, Jennie Churchill. Don’t miss our previous Churchill Chats with Jennie’s brother, Randolph Churchill, and Churchill biographer Paul Reid. It is with sadness that I inform you that I will be leaving the Churchill Museum to take up a new role as the President of the George C. Marshall Foundation in Lexington, Virginia. While I look forward to the new challenge I have loved my nearly ten years at the helm and can only look back with considerable pride at all that we have achieved over these many years. The new Museum exhibition, opened with such aplomb by Lady Soames in 2006, still amazes, inspires and delights visitors with its presentation of Churchill’s life and times; the myriad education and outreach programs we created have brought Churchill to new generations of young Americans and reminded others of why they admired him to begin with. Our recognition by the United States Congress in 2009 as ‘America’s National Churchill Museum’ helped underscore both our achievements to date and our ambitions for the future. 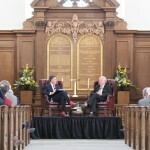 Simultaneously, our Kemper lectures and Churchill weekend have, year on year, exceeded expectations and brought world class speakers and Churchillians from around the world to the campus of Westminster College; Max Hastings, Sir Martin Gilbert, David Cannadine, former British Prime Minister Sir John Major, Ambassador Nigel Sheinwald to name but a few. Our magazine, The Churchillian, has set new standards of excellence in presentation and scholarship content for a Museum publication and done its part in spreading the word across the country and our web presence grows daily, too. Physically, the Museum and the magnificent Church of St Mary look better and the entry-way area, with the Iron Curtain sculpture at its center, attracts the eye like never before. This wonderful momentum will not cease with my departure and, if anything, will accelerate as the National Churchill Museum is positioned to spearhead the national commemoration of the 50th anniversary of Sir Winston’s death in 2015. It has been an honor and a pleasure to lead this magnificent national and international treasure. I can add only my deepest and most heartfelt gratitude for the support you have offered; without that, nothing could have been achieved. It would, of course, be remiss of me to end without some reference to the great man’s words. So many are apposite, so many would suffice but I leave with the following, delivered by Churchill in a speech to the Congress of Europe in 1948: ‘Persevere towards those objectives which are lighted for us by all the wisdom and inspiration of the past’. Nothing could be more appropriate for a history museum that looks to the future and remembers, so evocatively, the past. Above all else, consider those few words etched in the stone floor of Westminster Abbey, in London, words whose economy of language belies the enormity of their exhortation to action: Now and all in things, ‘Remember Winston Churchill’. Please enjoy the third installment in our Churchill Chats video series featuring Sir Winston Churchill’s great-grandson Randolph Churchill. Don’t miss our previous Churchill Chats with Churchill biographer Paul Reid and illustrator of The Quotable Winston Churchill Dan Martin. This week’s blog comes from Mandy Plybon, Education & Public Programs Coordinator at the National Churchill Museum. 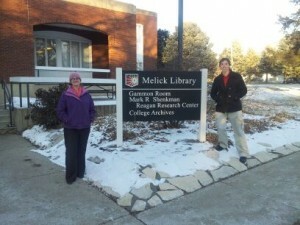 Mandy has been instrumental in starting the new Museum Studies minor at Westminster College. Here her take on the new program below. I am so excited to have this new Museum Studies minor at Westminster College! Museums are such an important part of our socio-cultural environment that the National Churchill Museum and Westminster College’s History Department felt it necessary to create this new minor. To me, museums share the responsibility of preserving and interpreting our cultural heritage. But, museums are more than just a building that houses objects. They are also made up of the people that work daily to ensure that history is preserved and shared, to create knowledge and to share information and experiences with the world. My start in the museum field professionally began in graduate school. While in the Folk Studies department at Western Kentucky University, I was lucky enough to intern at the Country Music Hall of Fame and Museum in Nashville, Tennessee. As a member of the public programs department, I developed both a Boy Scout Patch Program and a Family Activity Guide. That experience paved the way for my future in cultural heritage – and I am glad to continue my journey in this field at Westminster and the National Churchill Museum. The Museum Studies minor at Westminster looks to provide students with an introduction the museum world. 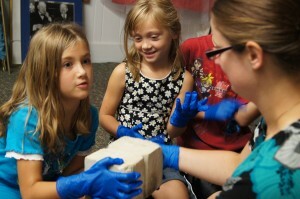 Through exploration, students gain an understanding of the museum as institution and an understanding of the challenges and responsibilities that museums and their staff members encounter. While housed within the History Department, the minor is open to students from all educational majors and cultural backgrounds. There are four museum-centered courses within the minor. These courses are predominately taught by me, with guest lecturers, field trips, and hands-on exploration supplementing the academic materials. Anyone interested in the museum or cultural heritage/tourism field is encouraged to talk with the History Department or myself about the minor. This week, Dr. Rob Havers looks at the current situation in the Ukraine and wonders if we can learn anything from Winston Churchill about this complex situation. With the apparent growing crisis over the future of the Crimea and the Ukraine, and the actions of Russia’s leader Putin, the media has inevitably pondered what exactly Winston Churchill might make of recent events. Given that last week saw the 68th anniversary of Churchill’s clarion call to action as he warned of ‘an Iron Curtain descending across the Continent’, many have jumped up to try and highlight similarities or continuities with the past and the present. What lessons can we take from that speech in 1946 in terms of the present? In 1946 the world was war weary, to say the least, and neither the populace of the USA or the UK was keen to hear Churchill’s warnings about the need to stand resolute in the face of the obvious ambitions of Josef Stalin, the erstwhile ally of the Anglo-Americans in WWII. Churchill, of course, knew the reality of life in Stalin’s Russia as well as anyone. But he underscored his pragmatism when he noted, in a speech to the House of Commons after the German invasion of the Soviet Union in 1941, that had Hitler invaded hell, he (Churchill) would have at least made a favorable reference to the Devil in the House of Commons. That pragmatism of course extended the other way too; Churchill knew when to play his hand and when not to do so. The ‘infamous’ percentages agreement attest to that. But Churchill, an implacable foe of ‘Bolshevism’ didn’t mince his words when he spoke at Westminster College asserting about the need to remain firm in light of the obvious westward ambitions of the USSR. He said that that ‘From what I have seen of our Russian friends and Allies during the war, I am convinced that there is nothing they admire so much as strength, and there is nothing for which they have less respect than for weakness, especially military weakness’. With all that being said, what lessons might we take away that might inform decisions with regard to the current situation in the Ukraine and Russia’s belligerent attitude? Undoubtedly, there is a strand of continuity here: Czarist Russia practiced a cordon sanitaire as a buffer with the rest of Europe and Stalin’s actions post WWII can also be seen in that vein, although with the more deliberate and insidious intent of spreading Communist influence. Putin today is in some respects carrying on that tradition and pressuring a Ukraine that seemed keen to look more towards the West and the EU; an act that was hardly to be unexpected. As for the curious oblast that the Crimea represents the presence of vital Russian naval bases, there was always going to be something the Russians would seek to preserve. The bigger questions, though, are what does the West do in response and what are the implications of their actions? Denunciations were significant in 1956 and 1968 when first the Hungarians and then the Czechoslovakians felt the full force of Soviet disapproval. Not much else followed, however. What might Churchill make of today’s developments and does the past give us any pointers as to the future? These days unilateral military action is beyond any of the European powers, and even the USA is careful to act within wider coalitions beyond formal arrangements such as NATO. While some of the more specious ‘lessons of history’ will certainly be trotted out with regard to parallels such as the Sudetenland, it is hard to see any western action being considered, or plausible, that would give Putin pause for thought. Two major military commitments, in Iraq and Afghanistan, and a diminution of military resources (for Britain and the USA) have left both nations lacking both the will and means for any more. Sanctions and strongly worded notes of ‘disapproval’ seem to be in the cards. What would Churchill do? The world he knew and acted within was a very different one to that which we know. It was a larger world in almost all respects. Churchill knew the importance of standing strong and inflexible, when the time was right but he also knew when to yield when his hand was weak. The agreements at Yalta showed us that much. Just as he called for a unified front in 1946 so too, today, can little be achieved unless those in the west and beyond can agree upon a course of action. When it is principles at stake, rather than solid and tangible national interests, that can be easier said than done. In 1939, just months after the Soviet Union allied herself with Nazi Germany, in the Ribbentrop-Molotov pact, Churchill famously noted that ‘I cannot forecast to you the actions of Russia. It is a riddle wrapped in a mystery inside an enigma’. That much, and probably little else, we can agree upon. Despite the winter weather that descended upon Fulton, the 2014 Churchill Weekend at the National Churchill Museum was a complete success. Thank you to everyone that contributed to this wonderful event, especially those of you who traveled in the harsh Missouri conditions! Paul Reid was this year’s Kemper Lecturer. Reid is the author of “Defender of the Realm”, the third and final volume of William Manchester’s biography of Winston Churchill. 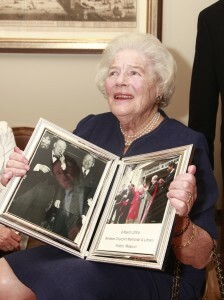 We were also honored by the attendance of Randolph and Jennie Churchill, great-grandchildren of Sir Winston Churchill. We were delighted to give our special guests tours of the Museum. Randolph and Jennie Churchill were proud of this memorial to their great-grandfather and his speech given here, on the campus of Westminster College, over half a century ago. Reid was particularly moved by the “Churchill’s Finest Hour” exhibit and corresponding video. The exhibit showcases artifacts and uses simulations to recreate The Blitz in World War II London. We welcomed nearly 100 guests to the Museum on Saturday evening for The Quotable Winston Churchill dinner. Sunday brought winter weather, but many Churchillians braved the snow and ice to gather for the Ask the Experts Brunch and Kemper Lecture. 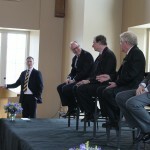 Sunday’s brunch programming allowed guests to submit questions to a panel of Churchill experts: Paul Reid, R. Crosby Kemper, Randolph Churchill, and Richard Mahoney. These experts discussed topics ranging from Anglo-American relations to what Churchill might think of the current situation in Ukraine. The Kemper Lecture followed brunch and was, for the first time, live streamed on our website to those who were unable to make it to the National Churchill Museum in person. This year’s Kemper Lecture was conducted in a new, interview-style format, with Dr. Rob Havers asking Paul Reid questions about Churchill and the writing of The Last Lion. After the interview, Paul Reid, Randolph Churchill, and Jennie Churchill were inducted into the Association of Churchill Fellows, a lifetime appointment. Thank you again for everyone who made this year’s Churchill Weekend such a success. We’re already looking forward to next year’s event! This week it seemed appropriate to think again of what has become, post-World War Two, of the most controversial aspects of that conflict, the strategic bomber offensive, pioneered by the Royal Air Force and actively supported by the USAAF after the American entry into the war. This was on my mind because I record daily ‘This Day in History’ segments for our local CBS station, KRCG, and rather than default to ‘14thFebruary, St. Valentine’s Day’, a more weighty historical event was perhaps the most emblematic single act of the bombing campaign; the destruction of Dresden. The debates over the rights and wrongs of this and perhaps, more pertinently given what was at stake in a total war, how effective these raids actually were in impacting German ability to prosecute that war, have been endlessly debated. The best exposition is to be found in Chris Harmon’s work ‘Are We Beasts?’. The title of course quotes Churchill who wrestled with the morale dimension of the bombing, especially as the war drew to a close and the outcome was apparent for all and obviously presaged the question of how to deal with a defeated Germany. Arthur ‘Bomber’ Harris, chief of Bomber Command, and both architect and leading proponent of strategic bombing (i.e. bombing that could win the war in its own right, never wavered in his conviction that it was the necessary, if not the right, thing to do. Harris famously featured in a propaganda segment about the activities of his bombers and ended it with an emphatic quoting of the wonderfully evocative lines from the book of Hosea, chapter 8, verse 7: ‘and they have sown the wind and now they shall reap the whirlwind’. We often look to history for both inspiration and for a guide or a template for how to think about the present and the future. Churchill advocated the study of history at every juncture in life. When looking at the bombing of Dresden from the comfort of our own times it is easy to pass judgment based on what we know now. At the time however, only victory would do, certainly early on, and the means to that end were less important than the end itself. It is a tribute therefore that Churchill despite his own moral concerns and considerations he did what he believed to be necessary to secure victory. What do you think? Do the ends justify the means? Let us know your thoughts on this episode of World War Two in the comments below. P.S. Churchill Weekend is less than two weeks away! Are you ready? Sir Winston Churchill’s great-grandchildren, Randolph Churchill and Jennie Churchill Repard, will pay their first visit to Westminster College to see where the famous “Iron Curtain” speech was delivered and visit the National Churchill Museum for Churchill Weekend March 1-2. They will be joined by acclaimed Churchill biographer Paul Reid, who will deliver the annual Enid and R. Crosby Kemper Lecture at 2 p.m., Sunday, March 2, at the Church of St. Mary the Virgin, Aldermanbury. The Kemper Lecture is free and open to the public. The Churchill descendants will hold a media availability from 3:30-4:00 p.m. on Saturday, March 1, in the National Churchill Museum. Members of the general public are invited to attend as well. The Kemper Lecture will be followed by a reception and book signing by Reid in the Museum where he will be available for media. Other Churchill Weekend activities include the Churchill Fellows Dinner on Saturday evening, March 1 and the “Ask the Churchill Expert’s Brunch” at 11:30 a.m. on Sunday, March 2, in the Backer Dining Hall of the Mueller Leadership Hall. Anyone interested in attending the Churchill Fellows Dinner should R.S.V.P. before Feb. 19. Guests may R.S.V.P. for both the dinner and the brunch online by visiting our website or by contacting Meda Young at 573.592.5602. Reid, a former feature writer for The Palm Beach Post, completed The Last Lion: William Spencer Churchill: Defender of the Realm, the long anticipated third volume of William Manchester’s best-selling biography of Sir Winston Churchill. Manchester, who was in ill health at the time, asked Reid to complete this project once year before his death in 2004. The Enid and R. Crosby Kemper Lectureship was established in 1979 by a grant from the Enid and R. Crosby Kemper Foundation of Kansas City, MO. The series is intended to provide lectures by authorities on British History or Sir Winston Churchill at the National Churchill Museum on the campus of Westminster College in Fulton, MO. The established Lectureship is held under the auspices of the British Institute of the United States and the National Churchill Museum. 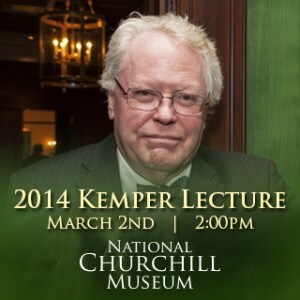 The inaugural lecture in the Kemper Lecture series was given by Martin Gilbert, the official biographer of Churchill. This week Dr. Rob Havers, Executive Director of the National Churchill Museum, reflects upon the death of Japanese WWII veteran Hiroo Onoda and what history tells us about never giving up. Many of you will have read the obituary of Hiroo Onoda in The Economist. He may not be terribly familiar to many, but reading his name took me back to my teaching days in the Department of War Studies at the Royal Military Academy, Sandhurst. Onoda was a Japanese soldier, an intelligence officer. He fought in World War II, like many millions of others, but unlike them Onoda kept on fighting after that war ended. He finally surrendered in March of 1974, nearly thirty years after Japan formally surrendered. He had lived off the land, and what he could steal, on the island of Lubang in the Philippines. He ignored all efforts to secure either his capture or surrender, and the latter came only after his former commanding officer was brought to Lubang and able to convey a direct order to him. Onoda was featured in my teaching at Sandhurst when we examined the spectrum of conflict and the distinctions between total war and limited war, as well as the vital importance of understanding how the culture of a society influences how that society will go to war and prosecute that war. These thoughts, about the challenges inherent in facing an opponent whose belief system may be very different from our own, came back to me as we prepared for our Reagan-Thatcher exhibition here at the National Churchill Museum, I found myself reading again Thatcher’s speech at Westminster College in 1996, entitled ‘New Threats for Old’. Thatcher, then, had been out of Downing Street for nearly six years and, unlike Winston Churchill when he spoke at Westminster, her speech was not a precursor to a return to power. The speech, though, is just as remarkable in many ways as the one delivered by Churchill; most notably in its prescience about the international situation. When Thatcher remarked that ‘We in the West may have to deal with a number of possible adversaries, each with different characteristics. In some cases their mentalities differ from ours even more than did those of our old Cold War enemy’ she captured so well the uncertainties of the post-Cold War world. That prescience was perhaps demonstrated most forcefully by the events on September 11th and the shock that accompanied those events and under which we continue to live. P.S. Don’t forget! Churchill Weekend is just three weeks away! Make sure to finalize your plans now! This week’s blog comes to us from Mandy Plybon, education coordinator at the National Churchill Museum. Continue on to hear from Mandy about one of the exciting new events put on by the National Churchill Museum in an effort to introduce Churchill to a new generation. This school year brought a new competition to the Churchill Museum. 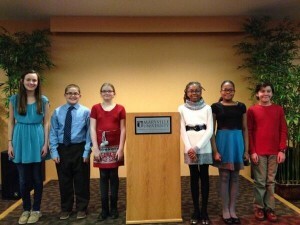 Thanks to the efforts of the Board of Governors Education Committee and two very knowledgeable volunteers, Becky and Randy Pierce, the Museum unveiled its first annual Winston Churchill Student Speech Competition in August. Open to anyone in grades six through eight, students were to write a speech on a specific Churchill quote. The quote chosen for our first contest was “Never confuse leadership with popularity.” Churchill gave this advice as he presented the current Duke of Marlborough a fob watch when the Duke came of age. We chose this quote because of the current political issues happening in the United States. We want the students to research and comprehend how leadership and popularity are related, how they co-exist, and how they are different. Most importantly, we want students to connect what Churchill said to the 21st Century and to their own lives. We decided to split the state into four quadrants-Kansas City region, Springfield region, St. Louis region, and a Mid-Missouri region. (View the map of each region here.) Schools held their own local competition to choose who would be their representative in the regional contests. So far, we have four students competing at the State level, two from the Mid-Missouri region as well as two from the St. Louis area. Competitors in the St. Louis regional competition, seen on the right, were hosted by Maryville University. Students who place in the top two of regionals receive “The Quotable Winston Churchill,” a book full of quotes and anecdotes by Churchill. At the State level, the top two winners will receive a plaque made from a Blenheim Palace tree (where Churchill was raised). The State competition will be held at the Churchill Museum February 17, 2014 at 3pm. Judges for the competition are both Westminster College faculty and National Churchill Museum board members. We’ll announce the Churchill quote for the 2014-2015 Speech Competition this coming September. P.S. Don’t forget! Churchill Weekend is just four weeks away! Make sure to start your planning now! Dr. Rob Havers discusses the National Churchill Museum’s newest exhibition and how it explores politicians of conviction. This is a response to The Telegraph’s recent article commenting on today’s “vanilla-flavoured” House of Commons politicians. This weekend sees the opening of our wintertime temporary exhibition exploring the relationship between two contemporary British and American leaders, President Ronald Reagan and Margaret Thatcher. The exhibition explores their fascinating relationship through text panels authored by Professor James Cooper, a recent Fulbright Robertson visiting Professor here at Westminster College, in addition to artifacts and documents loaned by the Ronald Reagan Presidential Library and his alma mater, Eureka College in Illinois. Both great leaders spoke here at Westminster College; Reagan in 1990 when he helped dedicate the magnificent ‘Breakthrough’ sculpture comprising eight sections of the Berlin Wall and Thatcher in 1996, on the 50th anniversary of Churchill’s own address. Her speech then, New Threats for Old, warned of the new dangers inherent with the ending of the Cold War and proved remarkably prescient as the events of September 11th demonstrated so tragically. What do all these individuals have in common? Great leaders, certainly, but also leaders of conviction, not circumstance; all willing to stick to their beliefs and be elected or not on the strength of those same beliefs. Being elected was only a means to an end, never and end in itself. Most remember well Margaret Thatcher’s comments on consensus, as discussed in The Downing Street Years, and how she lamented the need to seek consensus as an end in itself; asking instead “What great cause would have been fought and won under the banner ‘I stand for consensus’?” One of the most resonant passages in that work is one that always sticks in my mind when I hear politicians expounding on their ideas. At some point in The Downing Street Years, (and I’m paraphrasing a little) Thatcher relates how she was asked by an insistent journalist, ‘Mrs. Thatcher don’t you WANT peace?’ to Which she replied, ‘I want freedom and I’ll go to war to maintain it’. There in that exchange is what it means to be both a conviction politician and unafraid of doing what needs to be done. As I walked through our temporary exhibition I was reminded of this exchange and wondered where were our modern day Thatchers, Reagans and Churchills? Do you think we will see another politician with the conviction of Thatcher, Reagan, or Churchill? Or do you, like The Telegraph, believe that today’s politicians are “vanilla”? Let us know in the comments! 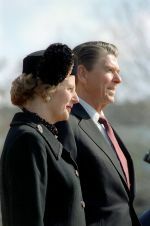 The close and unique relationship of world leaders President Ronald Reagan and Prime Minister Margaret Thatcher are explored in a new exhibit open to the public Jan. 13-March 9 at the National Churchill Museum on the campus of Westminster College. “Through the use of pictures and artifacts associated with these two great leaders, we are able to trace the influences that developed their character and personalities, their early political lives, their partnership on domestic and foreign issues and their legacy,” says Dr. 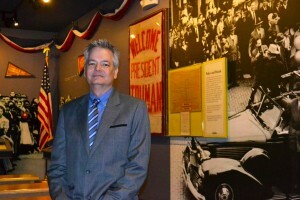 Rob Havers, Executive Director of the National Churchill Museum. The official opening of the exhibit will be from 1 p.m.-3 p.m. on Saturday, January 18, and will feature St. Louis Post-Dispatch artist Dan Martin and some of his art work. Martin draws caricatures of world leaders and other famous people. He has drawn a caricature of Sir Winston Churchill and was responsible for the illustrations in the book The Quotable Winston Churchill edited by Richard J. Mahoney with Shera Dalin. The volume includes a remembrance by Margaret Thatcher. Martin’s art includes the Weatherbird as well as caricatures of sports figures such as Stan Musial and Babe Ruth. Artifacts in the exhibit include photos of Reagan and Thatcher, an American literature essay written by Reagan while in college, Reagan’s honorary degree diploma from Westminster, gifts exchanged between the Reagans and the Thatchers, cowboy boots with the Presidential seal, a jelly bean clock, a satire piece with Reagan as Rhett Butler and Thatcher as Scarlett O’Hara, and caricature teapots of Reagan and Thatcher. Also, on display is the suit Reagan wore in the film “King’s Row,” which is on loan from the Kingdom of Callaway Chamber of Commerce. The exhibit was inspired by the research and newly published book Margaret Thatcher and Ronald Reagan: A Very Political Special Relationship, written by Dr. James Cooper, Senior Lecturer of History at Oxford Brookes University, who was the Fulbright Robertson Visiting Professor in British History at Westminster during the 2012-2013 school year. In his book, Cooper draws the comparison that Reagan and Thatcher both emerged in the political arena as outsiders in their political parties at times of decline in their country’s economies and a decline in world standing. Both espoused policies of less government intrusion, a conservative platform of lower taxes and balanced budgets and a firmer stance toward the Soviet Union during their years in leadership roles. 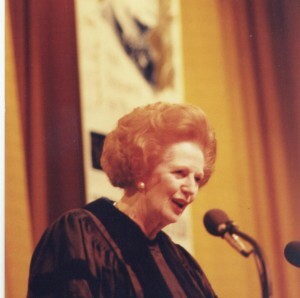 Reagan visited the Westminster College campus in 1990 to dedicate the “Breakthrough” sculpture and Thatcher was the 1996 Green Lecturer on campus. In honor of our newest temporary exhibit, “Ronald Reagan and Margaret Thatcher: Their Special Relationship”, we’re showing Reagan’s 1952 film “She’s Working Her Way Through College”. Join the us for the showing at the Missouri River Regional Library in Jefferson City on Tuesday, February 4, 2014, 7:00pm. 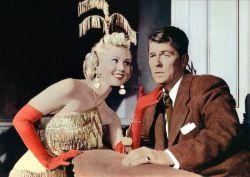 Starring Ronald Reagan as John Palmer and Virginia Mayo as Angela Gardner, the film follows burlesque dancer Hot Garters Gertie aka Angela Gardner as she decides to begin a college, meeting her former teacher John Palmer who is now a professor. Among romantic complications, Angela helps the downtrodden dramatic arts department put on a potentially popular musical show…but someone’s discovered her secret past. Does she have an ace up her garter? The new temporary exhibit “Ronald Reagan and Margaret Thatcher: A Special Relationship” is on display at the National Churchill Museum January 13, 2014-March 9, 2014. Cost to view this exhibit is included in general museum admission. For a sneak peek on what you will see at the exhibit, check out our blog posts from our trip to Reagan’s alma mater, Eureka College, and our unboxing of artifacts from the Reagan Presidential Library in California. Call 573-592-5369 for more information on the exhibit. Contact Museum staff for more information on the film screening. WHAT DID CHURCHILL MEAN BY "A UNITED STATES OF EUROPE"? This post is a response from Executive Director Dr. Rob Havers to a recent article from The Telegraph. We at the National Churchill Museum, obviously, live daily with the implications of what Winston Churchill said in his prophetic ‘Iron Curtain’ speech in March 1946. The Fulton speech, however, was not the only substantial pronouncement Churchill made that year. In September of 1946, Churchill delivered an address in Zurich, Switzerland once again at an institution of higher learning. On this occasion he spoke at the University of Zurich and, just as he had in Fulton some seven months before, he delivered a message of great political significance.There in Switzerland, Churchill advocated for ‘a kind of United States of Europe’ and that reconciliation and a partnership between France and Germany was crucial to this notion. What Churchill actually meant by this pronouncement has been argued over, endlessly. Churchill of course is well known for his foresight on many issues but often that wisdom can be miss-construed in the contemporary world. Certainly, when Churchill talked of an ‘iron curtain’ bisecting the continent of Europe the Berlin wall was nearly twenty years in the future and even the division of Germany itself was some three years ahead. So when Churchill called for a United States of Europe he did so without a firm idea of what that might look like and, far more saliently as far as the contemporary world is concerned, nor did he specify exactly what the role of the United Kingdom would be, if any, in that unity. Churchill of course was never beyond advocating what others should be doing or indeed what they should be thinking about doing: this was one of his most substantial gifts, his ability to help others to think about that needed to be done even if his own room for maneuver was somewhat more limited as indeed it was in 1946 as leader of His Majesty’s Opposition. The British Commonwealth of Nations, and Britain’s relationship to it, was foremost in Churchill’s mind then as was the United States so we should treat with caution contemporary claims about following Churchill’s lead, as should David Cameron. The real lessons to be learned can only be arrived at a far closer examination of what Churchill said and by following his admonition to ‘study history’*. What do you think about Churchill’s vision of a United States of Europe? Tell us in the comments below or on Twitter @churchillmuseum! All month we’ve been preparing for our upcoming temporary exhibit featuring the special relationship between Ronald Reagan and Margaret Thatcher. Last week we received artifacts from the Reagan Presidential Library in Simi Valley, California. We hope you’ll join us this January to explore this special relationship, the likes of which had not been seen since Winston Churchill and President Franklin D. Roosevelt. Dan Martin of the St. Louis Post-Dispatch will attend the opening reception for the National Churchill Museum’s latest temporary exhibit on Ronald Reagan and Margaret Thatcher. 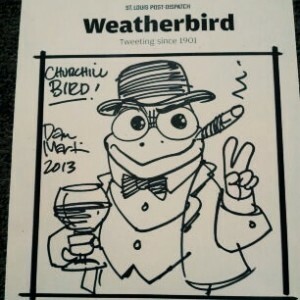 Martin is the cartoonist behind the Post-Dispatch’s Weatherbird and illustrated Richard J. Mahoney’s The Quotable Winston Churchill. To the right is a Martin illustration depicting Winston Churchill as the Weatherbird. The reception will take place at the National Churchill Museum from 1:00pm to 3:00pm on January 18, 2014. Guests can look forward to viewing some of Martin’s own drawings, which will be on exhibition, in addition to the temporary Reagan/Thatcher exhibit. “Ronald Reagan and Margaret Thatcher: Their Special Relationship” follows these two leaders as they challenged the political landscape and moved forward their domestic and foreign policies. Photographs and items from the Ronald Reagan Presidential Museum and Library and his alma mater, Eureka College, will be displayed with local history and his breakout movie, King’s Row, based in Fulton, Missouri. Churchillian traits such as character, heritage, and determination guide you through this fascinating look at a special relationship between two world leaders not seen since President Roosevelt and Sir Winston Churchill. This exhibit will be open at the National Churchill Museum from January 13, 2014 – March 9, 2014. This Wednesday, myself and two of my student collections workers from Westminster College hit the road for Eureka College in Eureka Illinois. President Ronald Reagan attended Eureka and attributes much of his success on his years there. Early next year, the National Churchill Museum will open a temporary exhibition focusing on the special relationship between Ronald Reagan and Margaret Thatcher. Eureka College was a natural partner for this exhibit. Their Museum focuses on the life and times of Reagan, with a special focus on his time at Eureka. They let us borrow a great deal of objects, photos, and memorabilia. Some of my favorites are a pair of cowboy boots with the presidential seal on them, a photo of Reagan as a life guard, and a small model of the home Reagan grew up in. We had a great trip! We stopped off in Hannibal to grab some early morning coffee, and somehow managed to take every back road in Illinois thanks to my GPS. The whole way back we talked about ideas for the exhibit and shared fun road trip stories. The Ronald Reagan/Margaret Thatcher exhibit will be at the National Churchill Museum from January 13, 2014 – March 9, 2014. Guests will be able to view the items we borrowed from Eureka, as well as artifacts from the Reagan Presidential Library in Simi Valley, California. A reception celebrating the opening of the exhibit will be held on January 18, 2014, featuring special guest Dan Martin of the St. Louis Post Dispatch. Martin, who illustrated Richard J. Mahoney’s The Quotable Winston Churchill, will be exhibiting some of his own drawings as well. We hope to see you at the Museum soon! KC PUBLIC LIBRARY ASKS, "HOW SHOULD WE RATE MARGARET THATCHER?" Last night I had the pleasure of attending Dr. Victor Bailey’s public lecture, held at the Kansas City Public Library, titled “The Iron Lady: How Should We Rate Margaret Thatcher?” Victor Bailey, a fellow ex-pat Brit., is the director of the Hall Center for humanities and the Charles W. Battey Distinguished Professor of Modern British History at the University of Kansas. Professor Bailey, on a cold Wednesday night in Kansas City, spoke to a packed house at the public library. 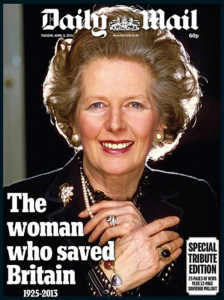 As the title suggests, Victor discussed both the background to Margaret Thatcher’s three-term premiership, as well as the wider context of Britain in the 1970s and 1980s. He also assessed her strengths and weaknesses and provided a remarkably balanced portrayal of an individual who tends to inspire somewhat polar opposites of emotional responses. This opposition was illustrated in Dr. Bailey’s lecture with the headlines seen on the right. 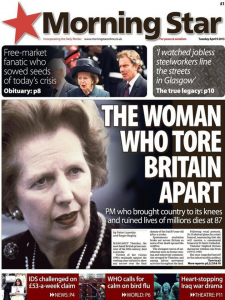 Each side of the political spectrum casts Thatcher in very different light. Margaret Thatcher of course spoke here in Fulton in 1996 to mark the 50th anniversary of Churchill’s Iron Curtain address at Westminster College, home to the National Churchill Museum. In the early New Year we will unveil a temporary exhibition that explores the relationship between Thatcher and another great leader to visit Westminster College, Ronald Reagan. Mark your calendars and visit us from January 13th, 2014 – March 9th, 2014. We look forward to furthering an ongoing discussion of these most influential global leaders in the coming months. The Missouri Military Academy and the National Churchill Museum are proud to present the MMA’s 73rd Annual Evensong holiday event. Evensong, presented December 19th at 6pm, is a program featuring a traditional telling of the Christmas story. The Mid-Missouri community is welcome to attend. This year’s Evensong program features the Missouri Military Academy Brass Choir and Chorus, as well as a special guest solo from Miss Missouri 2013 Shelby Ringdahl. The National Churchill Museum will host Evensong in the history Church of St. Mary the Virgin, Aldermanbury, on the campus of Westminster College in Fulton, MO. 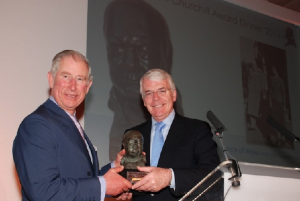 HRH The Prince of Wales has been presented with the Sir Winston Churchill Award for 2013. The Sir Winston Churchill Award is given to those in public life who are displaying Churchillian qualities and traits by The Churchill Centre (UK). “I am deeply touched, honoured and humbled because of this award. I will cherish the Oscar Nemon sculpture as it is one of the best 65th birthday presents I could have been given. “I have very fond memories of Sir Winston and remember him when I was very young coming to visit The Queen at Clarence House and at Balmoral. I was bought up on countless stories of Sir Winston Churchill, particularly from my uncle Lord Mountbatten, which were very funny. “Thank you for doing me this great honour, I will treasure the bust and it will remind me above all else of one of the greatest of Englishmen.”what Sir Winston said in 1908, ‘what is the use of living if it be not to strive for noble causes and make this muddled world a better place for those who will live in it when we are gone. How else can we put ourselves in harmonious relations with the great verities and constellations of the infinite and the eternal’. Dr. 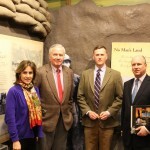 Rob Havers, Executive Director of the National Churchill Museum was in attendance. 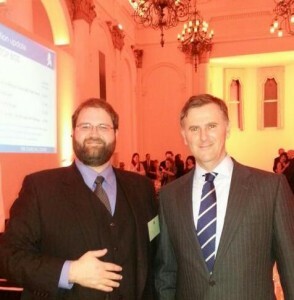 He is pictured to the right with fellow Churchillian Dr. Warren Dockter. “The Sir Winston Churchill Award is given to those – in public life – who display Churchillian qualities. It is a tough measure. “Sir Winston is probably – some would say certainly – the greatest Englishman in our long history. Great: not just because of his extraordinary achievements, but because of his capacity to hold his course when – as almost a lone voice – he was criticised …. only to be proved right in the end. “Our recipient tonight has – over the years – faced his own criticism, his own setbacks, yet held firm to his own beliefs. That is the first of many reasons he is truly worthy of the Award made to him. “He is never simply a “name on the letterhead”. Nor does he just “turn up” at events. He takes a genuine and personal interest in every organisation with which he is involved – and every engagement he undertakes. Today, he actively presides over a group of charities that collectively form the largest multi-group charitable enterprise in the United Kingdom. These charities are active in a wide range of areas, and span every community throughout the UK. Collectively, they raise over £100 million each year in support of their charitable aims. It is an incredible legacy. “2015 will mark the fiftieth anniversary of Sir Winston’s death. His wartime generation may be passing from the scene, but we want to ensure that his profile remains higher than ever. I am therefore thrilled that we have been able to assemble a formidable alliance of Churchill organisations to create an ambitious new global programme. Professor Sir David Cannadine is chairing our 2015 committee. Bloomsbury Academic have digitised the Churchill Archive and are about to deliver Churchill resources into all secondary schools in the UK and High Schools in the US, Canada and Kuwait. Central Missourians are invited to join the Westminster College community in celebrating the holidays with a traditional English Festival of Lessons and Carols at 5 p.m., Sunday, Dec.8, in The Church of St. Mary the Virgin, Aldermanbury at the National Churchill Museum. 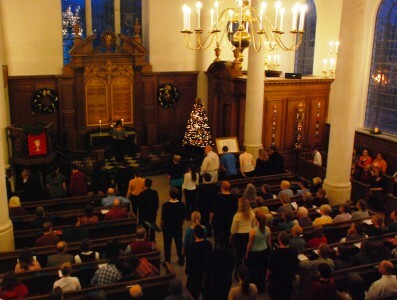 Modeled after the community festival held at Cambridge University every year, the service for Lessons and Carols includes the reading of the nine scriptures pertaining to the Christmas story and carols sung and performed by the Westminster College choirs and other area musicians. A reception will follow the worship service in the National Churchill Museum. This special holiday event is sponsored by Westminster College’s Office of Spiritual Life. Bring the whole family to the National Churchill Museum on December 2nd for our first annual Christmas tree lighting and open house! We’re excited to celebrate the Christmas season with our Callaway County community. You won’t want to miss all of the holiday activities we have planned! 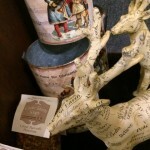 Our Victorian Christmas sale will also be open all day for all of your holiday gift-giving needs. Check out some of the items we’ll have for sale this year! We can’t wait to celebrate this time of year with our mid-Missouri family. Hope you can join us! Please contact Mandy Plybon with any comments or questions. This year marks Winston’s 139th birthday and we’re celebrating… with cake! 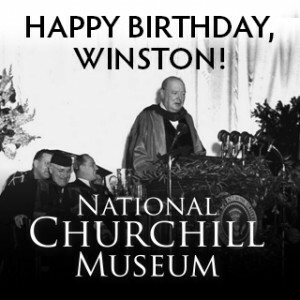 On November 29th, a day before Churchill’s actual birthday, every Museum visitor will receive a piece of birthday cake in celebration of Winston Churchill’s birthday. Make sure you don’t miss this opportunity to learn about a prolific global leader, and get a sweet treat, too! The National Churchill Museum is open daily from 10am to 4:30pm. Dr. 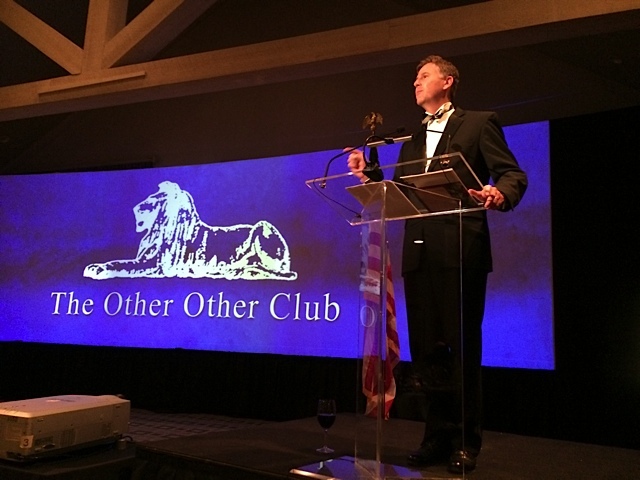 Rob Havers, Executive Director of the National Churchill Museum at Westminster College, was honored as the guest speaker at the Other Other Club in Tulsa, Oklahoma. The Other Other Club of Tulsa derives its title from the name taken by Winston Churchill and other kindred souls who took it upon themselves to form the “other club” in 1911 for irrepressible, outspoken conduct and unconventional political initiatives. 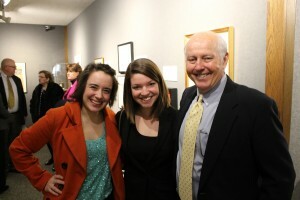 In addition to Dr. Havers and President Forsythe, the Westminster College community was well-represented. Joe Holmes, the Director of Business Operations at Westminster-West in Mesa, as well as several Westminster alumni, were in attendence as members of the Other Other Club. The National Churchill Museum is gearing up for Victorian Christmas, and that means mountains of Christmas gifts and goodies! You’re sure to find something, whether you’re looking for a new ornament for your tree, a Christmas present for kids to unwrap, or something unique for that person who has everything. We even have a special Doctor Who display for fans of our favorite Time Lord! Make sure you stop by the Museum Thursday, November 14th for the kickoff to our Victorian Christmas shopping event! We’ll have the traditional Kettledrum Tea to start our shopping off from 10am to 2pm, and food and drink as the day of shopping continues until 7pm. 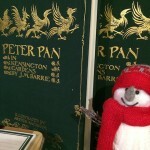 Find more information about the Victorian Christmas kickoff here. We’ll continue to have our Victorian Christmas shopping available throughout the holiday season for those who can’t make our kickoff on the 14th! Hope to see you there! For more information about the Museum gift store and our merchandise, please contact the Museum Store Manager, Becky McCue. Dr. Rob Havers will represent the National Churchill Museum at the Unveiling of a new Churchill Bust in The United States Capitol. WASHINGTON, DC – House Speaker John Boehner (R-OH) today announced that on Wednesday, October 30, at 11:00 a.m. ET, members of Congress will dedicate a bust of Winston Churchill at a ceremony in Statuary Hall of the U.S. Capitol. The bust is being placed pursuant to H. Res. 497, which was authored by Speaker Boehner and passed the House shortly before the 70th anniversary of Churchill’s wartime address to a joint meeting of Congress. Speaker Boehner has released a sneak preview of the event. Welcome to what will become a regular feature on our website- a blog dedicated to all things Churchill and the National Churchill Museum located here on the campus of Westminster College, in Fulton Missouri.This blog will feature news from the Museum but also views about Churchill, his life and times as well as the pervasive influence he continues to exert today. I hope also to welcome guest bloggers, those who visit our museum and those who speak here as well as those in the wider world who have a view of Churchill- but eminent Churchillians all. In recent weeks I was fortunate to journey back to England, accompanied by our Archivist/ Curator, Liz Murphy to explore the wonderful Jack Darrah Churchill/ Harwood Collection at Bletchley Park. Whilst there we were delighted to visit the Churchill College Archives Centre and to see, in situ, the original ‘Sinews of Peace’ speech nestled calmly and carefully in the vaults all under the watchful eye of the director Allen Packwood. It seemed to me then, as Allen gently handled the document, that we all pay lip service to the notion of the pen being mightier than the sword. When, however, you combine that consideration, the real power of words with the almost unparalleled delivery of a man like Winston Churchill then you really do have some most profound and substantial; something that can change the course of peoples and nations- a fact that we, as Churchillians, know only too well ( and which it certainly wouldn’t hurt the rest of the world to remember also)! Question: While listening to speech the quote, “War is Glorious” was credited to Winston Churchill. I was taken aback somewhat because I had no recall of such a statement as a stand alone sentiment by the late prime minister. I believed that Churchill had spoken admirably of the courage displayed by warriors and the levels of resolution and sacrifice as being glorious but not war as such. Can you verify this quote for me? On November 12 , after an election in Germany in which only the Nazi Party was allowed to canvass, the Nazis won 95 percent of the vote.’You have heard me described as a warmonger,’ Churchill told the Royal Naval Division Association luncheon audience two days later. ‘That is a lie. I have laboured for peace before the Great War, and if the Naval Holiday which I advised and suggested had been adopted, the course of history might have been different.’ It was the Nazis ‘who declare that war is glorious, who inculcate a form of blood-lust in their children without parallel as an education since Barbarian and Pagan times’. On this day in 1965 Winston Churchill died. The link below features rare colour footage of his funeral procession and strongly evokes how the nation, and the world, felt on this ‘day of sorrow’. Please watch and, as ever, ‘Remember Winston Churchill’. Question: I am a librarian from New York and I have a patron who inquired about the quote, “Those who fail to learn from history are doomed to repeat it”. We know the quote was originally attributed to George Santayana, however, our patron would like to know when Mr. Churchill first used it. Unfortunately, my colleague and I have not been able to locate the the time or context of quote as it relates to Mr. Churchill. When and where Churchill mentioned this phrase? I went through some books as below, but I didn’t find it out. I would be most grateful if you could provide information about it. Rhodes James. New York : Chelsea House Publishers, 1974. Seventeen days later on 25 October, Churchill returned to power as Prime Minister. Question: One of my favorite Churchill quotes is the sentence “I love to learn but I can’t stand to be taught.” I’ve heard this all my life. It occurred to me today that I would like to read the context of that sentence. I had always understood this was part of Churchill’s address to the US Congress in December of 1941. Today I found the text of his speech online and was surprised to see the sentence was not there. A thorough Google search turned up the sentence but not its origin. Did he say this or anything like it? Now I come to transport. No one underrates the difficulties and complications which the present century has brought to every country in the constant adjusting and readjusting of road and rail transport. Since we rose for the Summer Recess, we have given long and continuous study to the many difficult questions that have been opened. When the Bill is published tomorrow, the changes that we have made will be seen. I am sure that prolonged discussion has been beneficial. Personally, Mr Speaker, I am always ready to learn, although I do not always like being taught, but I shall not attempt to foreshadow the proposals which will be brought before the House tomorrow. HOW MANY BOOKS DID CHURCHILL READ? Question: I found second hand accounts that Churchill once estimated he would possibly read 5000 books during his lifetime. But my search for primary sources for this claim has failed. Answer: I recall one instance where “5000” comes up. In his essay “Hobbies” in Thoughts and Adventures, Churchill remarks that Lord Morley’s definition of “a few books” was anything less than 5000. But I cannot track anything he said about how many books he personally read. It was a lot, as he explains in his autobiography My Early Life. It began when he realized how little he knew, and had his mother send him countless tracts on politics, ethics, society, science, evolution and government. At least from his sixties he voraciously read novels, especially historical ones–Hornblower, for example. But how many in his lifetime? No idea. His photographic memory may make it seem that he read that many. He knew huge tracts of Shakespeare, Macaulay and the King James Bible and quoted them at will. Question: I work for an independent production company where we are making documentary series about TEA! The series looks into the history of tea and it’s relationship with British culture. I have heard about a quote from Winston Churchill in which he said that tea was as important as ammunition to the war effort. I wondered if this is something you knew of documentary evidence for it? Answer: We are going to assume you mean the drink and not the custom. We know he said “We must have a policy of ‘utmost fish,'” but there is no well-known remark about tea, which he avoided. After searching the 15 million published words for “tea war” and “tea ammunition,” we came to no result. We did look up “afternoon tea” and can offer you this comment by his Life editor, Walter Graebner, from My Dear Mr Churchill (London: Michael Joseph, 1965), 52…. Churchill never bothered with the English rite of afternoon tea. Even when guests had stayed over from lunch, he usually sent them off to the dining-room with Mrs Churchill, and dropped in himself only at the very end of the meal. Tea at Chartwell in any event was somewhat of a nursery affair, and more often than not consisted of assorted grandchildren in high chairs, a bevy of nannies, the usual number of dogs and only one or two stray adults. When Churchill did turn up it was usually with a whisky and soda in hand and a cigar in his mouth. He would arrange himself in a comfortable chair and watch the proceedings from the sidelines. Question: I am translating a book into English, written by Kató Lomb. I wonder if you could possibly help me find out whether there is any truth in two alleged quotations by Churchill. As a punch line, let me cite the response given by Churchill when he was asked whether, in the post-war world, one should endeavor to eliminate multilingualism and all peoples should speak the same language. “Of course,” the old politician said, “English!” I searched for a long time in numerous variations but I could not find any source for this statement. Maybe it was not even said by him but by someone else. Maybe it was just expressed differently. Anyway, I’d prefer to insert some footnote about the most likely truth value of this statement, or maybe a rectification if needed. Winston Churchill was generally known to use a number of terms even in everyday speech. Once I asked him, “Is it true that you know 45,000 English words?” “It is,” he replied, “and I learned the bulk of this vocabulary from the works of a hardly known 19th century author.” Frankly speaking, I was so unfamiliar with this writer that his name, in fact, escaped my memory. I didn’t find any source whatsoever for this 45,000 words, neither for the 19th century author, or any similar claim by Churchill. He did champion the use of “Basic English,” which you can look up on the web. It is a constructed language of fewer than 1000 words invented by Charles Ogden in 1930. He thought this could become a kind of “international language” which all people could learn and use. In a way he was on the right track, since English has become the dominant international and Internet language. Most of the hundreds of alleged Churchill quotations that have no basis in fact stem from wishful thinking, or attaching his name to something some more obscure person said. If the suspect quotation has no reference or solid attribution, you are right to suspect it. Question: I was just reading Huxley’s ANTIC HAY, and in a passage on the eccentricities of famous pols appears the sentence, “Some wear curious ‘ats, like Winston Churchill.” I wasn’t aware of that [though i knew about his odd suits during WWII]; do you know anything about Churchill’s eccentric headgear? Answer: Yes, he was known for a variety of eccentric headgear, and cartoonists had a field day in the 1920s, see attached. Recall the ten-gallon hat, the African Journey pith helmet, the poilu helmet in WW1, the Indian headdress, that Canadian hat given him in 1941……But Churchill himself pooh-poohed the notion. (The essay referred to below is “Cartoons and Cartoonists,” in Thoughts and Adventures)….. But deMendelssohn adds: It is a good story but hardly good enough to be true unless he never became aware of the marked difference between his own favourite head-gear and that normally worn by the rest of his fellow-men. art,” but I’ve had no luck finding the source. Answer: As far as we know Churchill offered no opinions about “abstract art,” other than respect for all artists. There was on incident which has since been corrected that involves a negative ‘statement’ about Picasso. Our next Churchillian will look at Churchill’s views on Moses and Jewish National Sovereignty. Want to receive our quarterly publication? Learn more here. CHURCHILL THE FIRST TO USE OMG PHRASE?! Do you believe the authenticity of that letter? And do you know if there is a hand-written version of that letter? If so, where? Answer: There’s no doubt that it’s genuine, however the information has been around quite some time. Lord Fisher reproduced the letter in his book, Memoirs (New York: Doran 1919), 77. And the same letter was reproduced by Admiral Bacon in his biography, Admiral of the Fleet Lord Fisher, 2 vols. (London: Hodder & Stoughton, 1929) II 194. Fisher had a flamboyant style of writing and this was typical. So our thoughts would be to credit the acronym to Jacky Fisher! 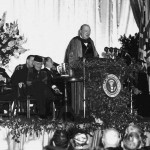 Question: What category of Honorary Degree did the College award to Winston Churchill on the 5th May 1946. Question: I saw on facebook a quote attributed to Winston Churchill. I can find no documentation to support his saying or writing these words. Can you help me to verify it is an accurate quote or a misattribution? House of Commons, 1949, 3 FEBRUARY. He was arguing against the increasing regulations of industry and commerce by the postwar Labour Government (1945-51). Question: Dear Sir or Madam, As a post-doc at Tuebingen University (Germany) I am currently working on a paper about Sir Winston Churchill’s reception of Thucydides which is part of a larger project on the reception of that very historian organized by the University of Bristol (UK). I try to find out, if there possibly exists a list or an overview over Churchill’s private library, i.e. I try to find out, if – and if yes – since when he may have possessed a personal copy of the ancient historian’s Peloponnesian War. So far I did not come across such a list. Therefore I would be very grateful for any help. Answer: Dear Sir, Churchill first read Thucydides as a boy at Harrow or Sandhurst (where it was likely in the curriculum). In September 1913, on a cruise aboard the Admiralty yacht Enchantress, Churchill and his private secretary, Eddie Marsh, visited Sicily. The Prime Minister, H.H. Asquith, a great scholar of the classics, was also on board, and Marsh recorded that Asquith “brushed up on his Thucydides for the occasion.” Churchill and Asquith then held forth on the Peloponnesian War. Similar comparisons to Thucydides were made by the historian R. W. Thompson about Churchill’s World War II memoir, The Second World War; and, more recently, by Professor Paul Rahe of Hillsdale College about Churchill’s The River War (1899). Professor Rahe has done serious study of The River War, and I am taking the liberty of copying him with this message. By “Sparta” I presume that Beaverbrook was referring to Churchill’s critics. The war had been going badly, but Churchill had won a vote of confidence by 464 votes to 1 on 27 January 1942. Question: I am told that Churchill was Lord Warden of the Cinque Ports, but that the Cinque Ports actually number seven! Can you provide any information about this post? Who held it after Churchill’s death? Answer: The origins of the Cinque Ports are lost in antiquity, but it is generally agreed that the confederacy began long before the Norman Conquest in 1066. England offered no effective naval resistance to attacks by the Danes and Normans, so the ports of Hastings, Romney, Hythe, Dover and Sandwich formed an association to provide naval defense. Winchelsea and Rye were added later, accounting for the total of seven. The ports had silted up by the 20th century, but the high honor of Lord Warden continued. Following Churchill, the Lords Warden have been former Australian Prime Minister Robert Menzies (1966-78), Queen Elizabeth the Queen Mother (1978-2004) and Admiral Lord Boyce (2004-date). In the event, these little worries were overcome and the installation ceremony was held in 1946. Churchill delighted in the splendid antique uniform and in flying the Lord Warden’s flag from Chartwell’s rooftops. Unfortunately the flagpole was located too close to a chimney, and he left off flying it after paying for several expensive replacements. Question: Churchill was once asked what year of his life he would like to live over. What was it? Answer: His lifelong friend Violet Asquith, daughter of the Prime Minister H.H. Asquith, asked him that after World War II. He replied: “1940—every time.” That was, of course, the year Churchill’s Britain defied the mass might of Nazi Germany, unaided except for the Commonwealth, and changed world history. Answer: We can find no reference to Hessians, except with regard to the 1775 Battle of Trenton. The quotation sounds vaguely like him, possibly an aside in a conversation, and may thus have been reported in someone’s memoirs–but we regret we cannot track it. (From Kay Halle, Irrepressible Churchill (New York: World, 1966), 301. Take a tour through the life of Winston Churchill at the National Churchill Museum located in Fulton, MO. This video brings to life the story of Winston Churchill and the world he knew. Recently rebuilt from the ground up the new displays and the permanent exhibition, together with host of associated historical and cultural activities that support it was recognized the by the United States Congress as America’s permanent tribute to this great man and formally recognized as America’s National Churchill Museum.